It all started with a free toll booth pass. See press release below. A major U.S. specialty salt supplier will be giving each attendee of the conference $5 dollars with the hope that they will use the money for a kind gesture or act of goodwill towards a complete stranger. 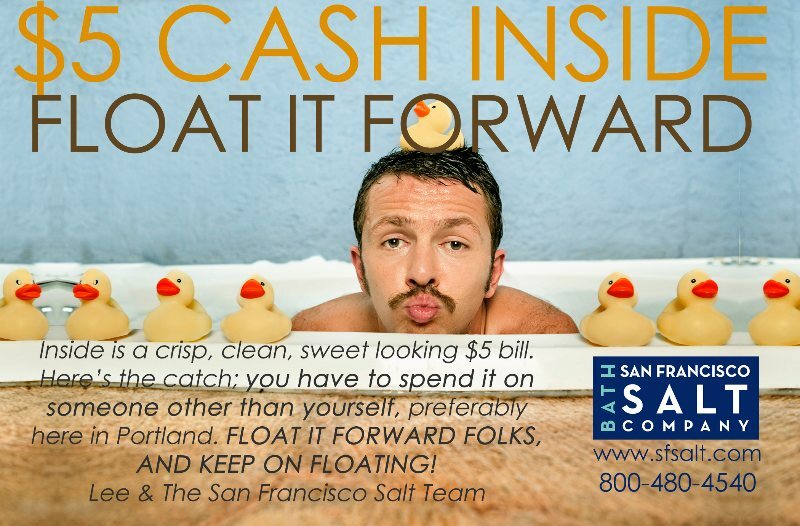 San Francisco, CA, August 11, 2015 /PR Newswire/ -- San Francisco Salt Company (SFSC) is “Floating it forward” at the Portland, OR Float Conference this weekend (August 15-16). By providing each of the 500 conference attendees $5 dollars, SFSC will be proposing that each person spends the money on someone other than themselves while spending time in Portland during the annual float conference. Williamson goes on to explain, “Recently, a car ahead of me paid my toll on the Bay Bridge in San Francisco. I was stunned and elated. This was a total stranger that I never got to thank. So to pass along the good karma, I paid the toll for the person behind me. The interesting thing is, although it felt good to get my toll paid, it felt even better paying someone else’s toll. SFSC is a major supplier of U.S. Pharmaceutical Grade Epsom Salt, a key component to the success of Floating. The Portland Float Conference is the largest event for the Float Community, designed for anyone and everyone interested in float tanks and floatation therapy. It is organized and run by Ashkahn Jahromi and his team at Float On, trailblazers and pioneers in world of floating. Floatation Therapy was first introduced in 1954 by Dr. John C. Lilly. His studies and experiments were based on the human response to sensory deprivation. Although floating has been around for quite some time, it has seen exponential growth within the last few years and is one of the fastest growing niche business’s in the U.S.A.
SFSC is a major supplier of Epsom Salt, and is one of the fastest growing specialty sea salt suppliers in the U.S. They have a diverse line of bath and spa salts as well as gourmet chef salts. Their mission is to raise awareness of the amazing benefits of natural sea salts.